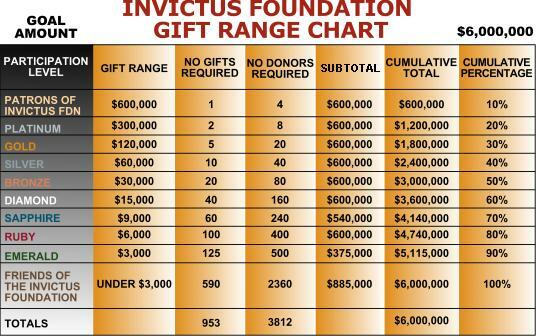 The Invictus Foundation’s Centers will be funded, shaped and built through acts of philanthropy, partnerships with corporate sponsors, and donations from individuals. In the Courtyard of Contributors of each Center, there will be a “Donors Walkway.” This walkway will memorialize all who have contributed to the building and operation of the Invictus Foundation’s Centers for Traumatic Brain Injury and Psychological Health. Gift range chart that visually represents the capital development dollars necessary to build each Center. 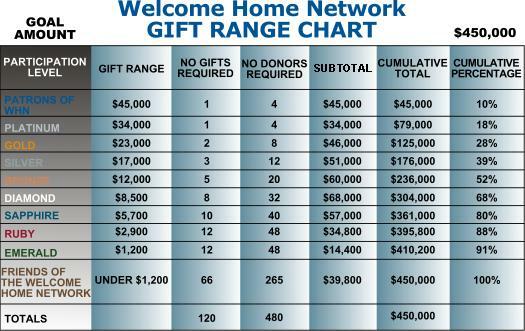 Gift range chart that visually represents the capital development dollars necessary to build each Welcome Home Network. Thank you for your interest in being a part of this dynamic volunteer-supported foundation! We very much appreciate the people who choose to invest their time with us. Please know that each area of volunteer service is special and unique and may operate under its own requirements and guidelines. Learn about the Invictus Foundation by investing time on our site. We want you to be well informed about the many facets of the Foundation. Realistically consider how you may invest your gifts of time and talents as you complete the online volunteer application. Please be patient and flexible with us as we attempt to engage individuals, families, churches and businesses to help make a difference. Have fun! We are excited to have your help and look forward to working with you! Thank you again for your interest. If you do not hear from us in 10 business days, or if you have any questions, please call our Administrative Office or email us. Please be sure to include your name, phone number, and the best time to call you. The Invictus Foundation works with a wide variety of companies, organizations, and nonprofits. We strive to build unique programs that leverage our partners’ strengths. If you’d like to learn more about partnering with the Invictus Foundation email us.